Skipping warm-ups and lifting too much can lead to injury. Exercising is one of the best things you can do for your health, and you deserve an enthusiastic pat on the back for any amount of physical activity you're doing. But if you're performing your exercises the wrong way, you could be hurting, not helping your body. One of the biggest exercise errors is using improper technique. You risk back injury if you arch your back while doing planks or push-ups, and knee injury if you bend too deeply in a lunge or squat (see "Move of the month"). Another mistake is doing the wrong exercise. For instance, running when you have severe back or knee arthritis puts too much pressure on the joint. But those are just a few exercise no-nos. Consider the following, and see if you need to take steps to fix them. Movement: From a standing position, lower your buttocks toward the floor as if sitting down. Stop with your buttocks above knee level. Keep your back straight, not arched. Return to the starting position. Repeat 10 times. You need to warm up your muscles so they're more flexible before you put them to work, especially when you get older. "An older person has less flexible muscles and tendons. Muscles can tear easily because they have less water content, and they're brittle and less elastic," says Clare Safran-Norton, clinical supervisor of rehabilitation services at Harvard-affiliated Brigham and Women's Hospital. Fix it: Warm up your muscles before exercising with a few minutes of repetitive motion such as marching in place or doing arm circles. That gets blood, heat, and oxygen to the muscles and makes them amenable to change. An occasional or weekend workout is less effective than more frequent activity, and cramming a week's exercise into a single session increases the risk for injury. 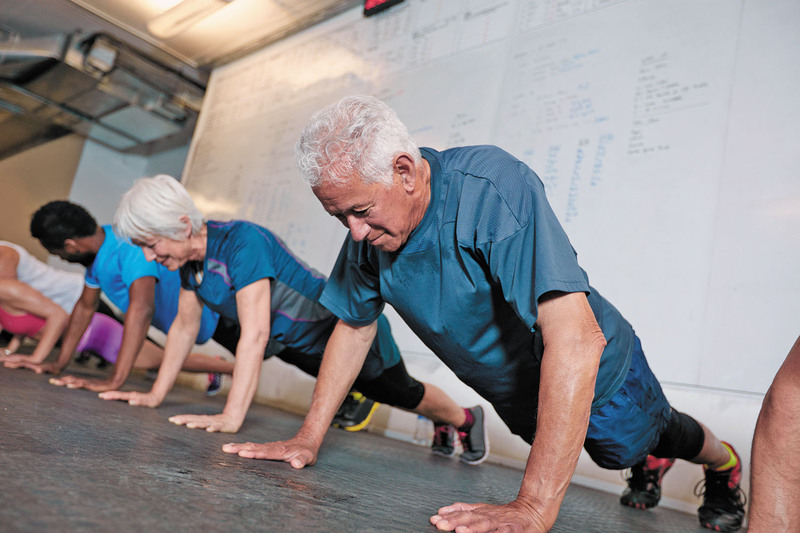 Fix it: For most people, the weekly goal should be 150 minutes of moderate-intensity exercise (that gets your heart and lungs pumping) and strength training at least twice per week. That could consist of shorter aerobic workouts (at least 20 minutes) each day or longer workouts (at least 50 minutes) three times per week. Lifting too much weight — especially lifting too much too soon, if you're just starting to get back into a routine — can lead to muscle tears. Fix it: Use lighter weights and lift them more times. "Do two or three sets of 20 lifts using 2-pound weights instead of one set of five or 10 with a 5-pound weight," Safran-Norton says. Working the same muscle groups every day can cause injury. Muscles need at least 48 hours after a strength workout to recover and rebuild. Fix it: Alternate which muscle groups you work from day to day, such as arms and shoulders on Tuesdays and Thursdays, but not Mondays or Wednesdays. Fluids help cushion your joints and stabilize blood pressure and heart rate. Exercising causes you to lose water and electrolytes (sodium, potassium) when you sweat, and it also causes lactic acid to build up in your muscles (which can lead to muscle cramps). Fix it: Healthy people need six to eight cups of fluid per day, and more if they're exercising. "Some people do well with water; others do well with a sports drink to replace electrolytes," Safran-Norton says. Exercising with slouched posture and rounded shoulders puts you at risk for back and shoulder injury (such as a rotator cuff tear). Fix it: Keep your shoulders down and back, keep your back straight, and work with a physical therapist to correct poor posture. Make an appointment with a trainer or physical therapist, or check out the Harvard Special Health Report Starting to Exercise (www.health.harvard.edu/e).